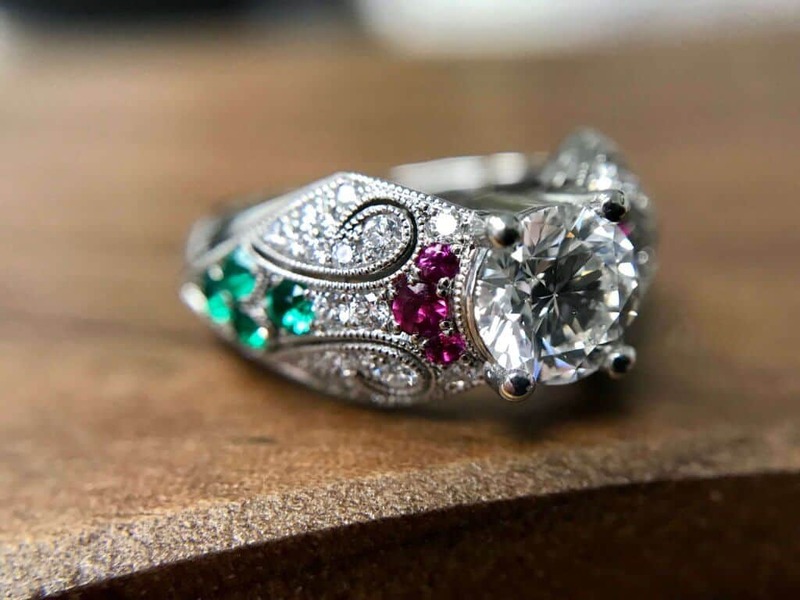 If you want the sophistication and authenticity of a vintage engagement ring with a modern twist, there are lovely alternatives and reproductions that not only challenge the virtue of the vintage style, but also awe the eye of the beholder. These rings are great for showing your individual character and fashion sense. They are an expression of your tastes and allow others a glimpse into your character. Jewellery should be fun; as well as, a manifestation of adoration. Use the framework of an heirloom and build upon it at your favourite jeweller, or build from a plain band of your choice and add distinctive engravings to let the vision of your engagement ring come to life. This will let the trend of the vintage character come through, and still emphasize a personal and modern theme. A good jeweller can take pictures and videos of vintage styles and turn them into a new custom creation. r in a remounted cluster for visual effect. If you have more love for an opal, pearl, or sapphire ring that is otherwise dingy and tired, make the stones your own and reinvent their look by remounting them on a flattering band (for example, rose gold for pearl, white gold for sapphire,etc.) and make your statement. The result will be a beautifully handcrafted, modern engagement ring still retaining full sentiment of the vintage ring itself. If you have jewellery in the safe or otherwise not being used, putting the diamonds and gemstones to use in a new piece is the best way to preserve the history and meaning of the jewellery you already own. The new piece of jewellery will lead to many years of enjoyment. After all, jewellery is meant to be enjoyed and displayed for all to behold. Rather than selecting a truly vintage engagement ring, that is to say, a ring dating back before this generation’s productivity, selecting a ring based on stylistic preference alone is an option. Amazing reproductions are available that have the qualities of vintage rings such as hand engravings and the types of metal used. Visit any jeweller and ask to see vintage inspired rings and they may have a small catalogue or case, but this will not get you a modern twist. For a modern look and the vintage feel, the best bet is to check out online places like Etsy and Pinterest and use an outline of your own design. Map out your ring and you’ll be able to find, at least, a place to start. It would also be wise to visit high-end jewellery stores such as Birks or Graff for some ideas. Remember, even the most outlandish designs can be toned down and modified into a more modern everyday look. Take pieces of various styles, take out the sections you don’t like and add what you do like. Use applications such as Photoshop to visualize the piece and allow yourself to experiment with your ideas. Sketch by hand if you prefer or print out images on paper and make hand notes. The secret is, you don’t have to be a high-end designer to make your own unique, wonderful piece of jewellery. You just need to enjoy yourself and spend time on various options and permutations of what you think you would like and then build on these ideas. Sometimes meeting with a jeweller can be helpful as they will add the necessary knowledge and experience. They will be able to guide you as to what is possible in terms of function and go over the any limitations that may present. The more information you have for the jeweller, the easier his or her job will be. A great jeweller will be able to see your vision and execute the creation of the perfect ring. By giving them a plethora of high quality photos and examples, you will be able to explain your needs and desires as best you can to get across your ideal ring. In addition, searching for new ideas gives you the option to really explore all of the possibilities available. Take your time, and enjoy the process. If you love it, wear it. Did you find a really beautiful piece of jewellery you just love, but may have already seen a few miles? Don’t worry, it can look almost like new with very little effort! One of the great things about jewellery: it ages gracefully. Take your find to your local jeweller and ask them to give the ring or necklace a polish and cleaning. The jeweller in most cases will be able to polish the metal smooth again and clean it so that it looks like a new ring. Jewellery spends a lot of time out in the world. Most of the time, all it needs is a good clean and polish. Regular cleanings and servicing of any jewellery is recommended to keep it shinning as much as possible and looking it’s best. 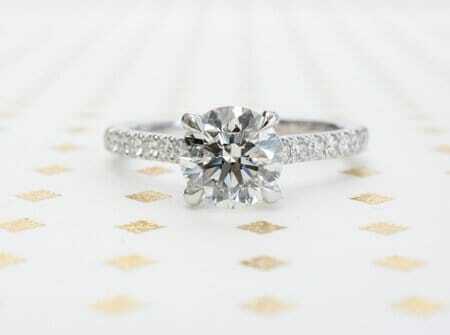 There are a thousand different options for engagement rings today, and a thousand more variations per option. It’s meant to be memorable, important, and beautiful; but, remember, have a great time doing it! If you want a star shaped stone made of black onyx, do it. If you want to wear the same ring your grandmother wore, wear it. If you’re still looking for you and it’s not “in style”, be you. Whatever is modern today won’t be tomorrow. Vintage was once the modern, so remember to enjoy what you’re celebrating. Congratulations and good luck!